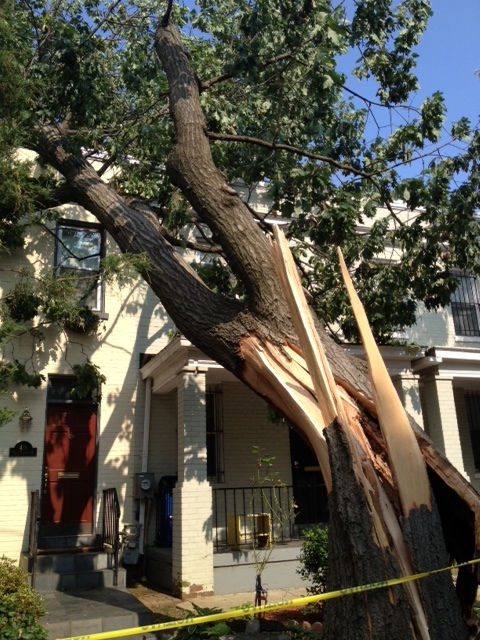 Friday’s storm hit this tree on the 400 block of 15th Street SE. Fortunately, there were no injuries or damage. Crews removed the tree earlier today. If hiring a tree specialist or landscaping company to cut up fallen trees and limbs, please have your contractor remove all the debris, limbs and branches. From July 1-July 7 only, DPW will remove from the treebox space(s) in front of residents’ homes, branches that are cut into 4′ lengths and tied into bundles no more than 2′ in diameter. These items can be placed where the residents’ trash is collected or they may bring them to the Ft. Totten Transfer Station, 4900 John F. McCormack Road, NE, weekdays (except July 4th, Independence Day) between 1 pm and 5 pm, or Saturday, July 7, between 8 am and 3 pm. Directions to Ft. Totten: Travel east on Irving Street, NW, turn left on Michigan Avenue, turn left on John F. McCormack Road, NE and continue to the end of the street. Please place debris, bagged or loose, in the treebox space, not the gutter or street so the gutters can remain clear and crews can run mechanical sweepers along the curb lanes and gutters. Also, DPW asks residents to resist putting the debris in the street to help prevent flooding in case of rain before the debris is collected. Do not include rocks, stones or concrete. Crews from the District Department of Transportation (DDOT) are continuing to remove fallen trees, beginning with trees blocking public space or pose a danger to homes or vehicles. Please report any issues to 311. This entry was posted on Sunday, July 1st, 2012 at 5:22 pm and is filed under Uncategorized. You can follow any responses to this entry through the RSS 2.0 feed. You can leave a response, or trackback from your own site.